So the global currency wars are hotting up. As I expected, the first aggressions across the Pacific are coming from America. Why? Because with the current drift of globalisation, America is losing out, while other nations are gaining. A few hours ago, the maniac simians at the Senate finally did it and fired the first round in the great US-China currency war, after they took aim at one of China’s core economic policies, voting to move forward with a bill designed to press Beijing to let its currency rise in value in the hope of creating U.S. jobs. As Reuters reports, “Senators voted 79-19 to open a week of Senate debate on the Currency Exchange Rate Oversight Reform Act of 2011, which would allow the U.S. government to slap countervailing duties on products from countries found to be subsidizing their exports by undervaluing their currencies. Monday’s strong green light for debate on the bill bolsters prospects it will clear the Democrat-run Senate later this week, but prospects for action in the Republican-controlled House of Representatives are murky. If the bill did clear both chambers, it would present President Barack Obama with a tough decision on whether to sign the popular legislation into law and risk a trade war with Beijing, or veto it to pursue a more diplomatic approach.” The response has been quick and severe: “China’s foreign ministry said it “adamantly opposes” a bill pushed by the U.S. Senate that will allow the United States to impose duties on countries that undervalue their currencies.” And just because China is now certain that the US will continue with its provocative posture, most recently demonstrated by the vocal response in the latest US-Taiwan military escalation, we would not be surprised at all to find China Daily report that China has accidentally sold a few billions in US government bonds. What does it mean for America (and other nations) to pursue the trade war route? Well, it means a whole lot of effort and policy-making will go into a “solution” that really doesn’t have much bearing on reality. Currency manipulation doesn’t necessarily boost export competitiveness. That’s because in a global marketplace prices aren’t that sticky — they adjust to reflect the relative values of currencies. If Chinese goods were so under-priced, Chinese inflation would likely be significantly higher. Chinese inflation seems to be slowing. 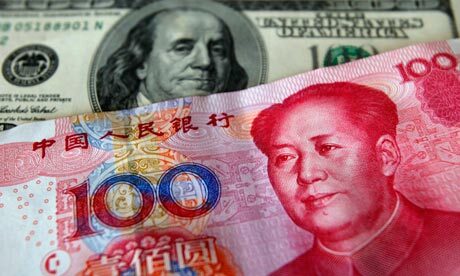 If China ceases to peg the yuan to the dollar, the yuan would certainly strengthen, but goods priced in yuan might not ultimately get much more expensive in dollar-denominated terms, especially in the long run. Second, the uncompetitiveness of American manufacturing. In my view American manufacturing is uncompetitive because trade conditions are artificially level, and global shipping costs and insurance costs are artificially low — a situation bought and paid for solely with American tax dollars. This means America not only accrues debt through military overspending, but it also has gutted much of its productive infrastructure, and hard-to-rebuild supply chains and skills. If America were to close half its military bases, and slash its military spending in half (still leaving it as by-far the biggest military spender in the world), insurance and shipping costs would likely significantly rise, making made-in-America goods significantly more competitive in the American market — and making a balanced US Federal budget much more achievable. Other nations would either have to choose between making up for the deficit in global security out of their owns budgets, or forfeiting the benefits that global security brings to shipping costs. The ultimate consequences of this crazy zero-sum trade/currency war will be a swifter end to the reign of the dollar as the global reserve currency. Why? Because threatening your greatest creditor with tariffs is a surefire way to get them to dump your debt, bursting the bond bubble, and making American debt significantly harder to sustain with resorting to money-printing. This entry was posted in Current Affairs, International Relations and tagged bernanke, black swans, geithner, globalisation, new economic geography, pax americana, sino-american trade war, supply chains, wen jiabao. Bookmark the permalink. Agreed. But I still can’t see how Japan in its late 80s got its economy busted by a rapid currency appreciation(it was about 3x). Japan at that time was a much manufacturing-biased economy with population density parring or exceeding that of China and had tons of dollar reserves as a result of decades of trade surpluses. I doubt America can sustain the same kind of life-support no-growth economy that Japan has managed to sustain, because unemployment in the US is residually higher, and it is a much less deferential and more individualistic society. The kids in America will overthrow the government unless there is a jobs and growth recovery.